Happy Day after Thanksgiving! Are you celebrating again today with MORE turkey and stuffing and all the fixin’s?? We had Thanksgiving with Stephen’s family yesterday and will be doing it all again with my family today. As it turns out, there is in fact a limit to how much turkey and pumpkin pie one person can eat. I discovered the threshold yesterday. I’m also doing my best today to avoid my email “promotions” folder. I’m a HUGE sucker for gimmicks like “this is our BEST sale of the year!!”. I’m also an impulse buyer. The combination of those 2 things makes black Friday and cyber Monday rather dangerous for me. SO, I’m doing my best to avoid them altogether. Instead of shopping, I plan to spend my weekend finally getting our house decorated a little. I’m headed to Home Depot soon to agonize over paint colors and hope that I make the right decision (because man is paint expensive!). I want to paint our bedroom navy blue and one of the side rooms in our house the green-ish color that I had (and LOVED) in my old house. I also need to buy about 100 picture frames because apparently when you’re approaching your 30s, it’s no longer acceptable to have unframed posters hanging on the walls….?? SO, after all of the painting and eating, I’m going to do my best to eat healthy leading up to all of the Christmas festivities. I don’t find eating healthy very hard, honestly. I LOVE a good salad and as you can see, I’m newly obsessed with these green smoothies. However, what I do find rather difficult, is not eating poorly. I’m the kind of person that will eat a veggie packed salad and then follow it up with a beer and a cheese burger. So, I’m eating healthy, but also…not. 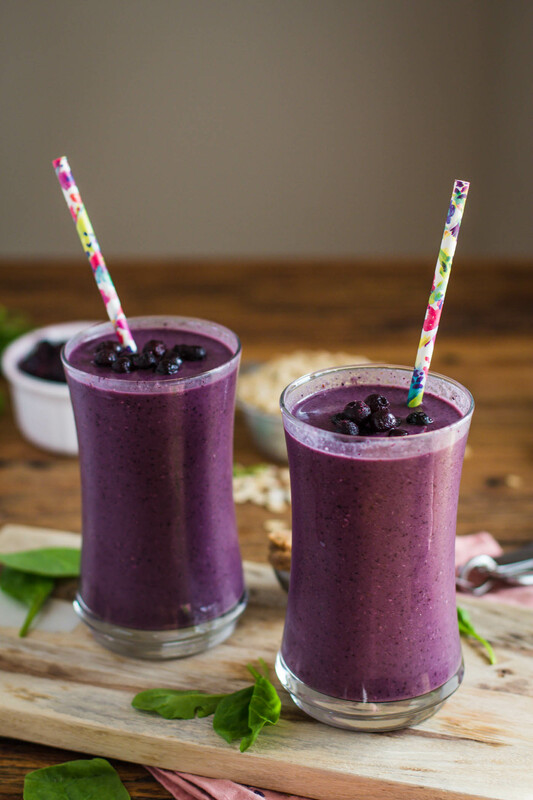 My goal from now (and by now I mean starting on Sunday) until the new year is to drink a green smoothie every single day. 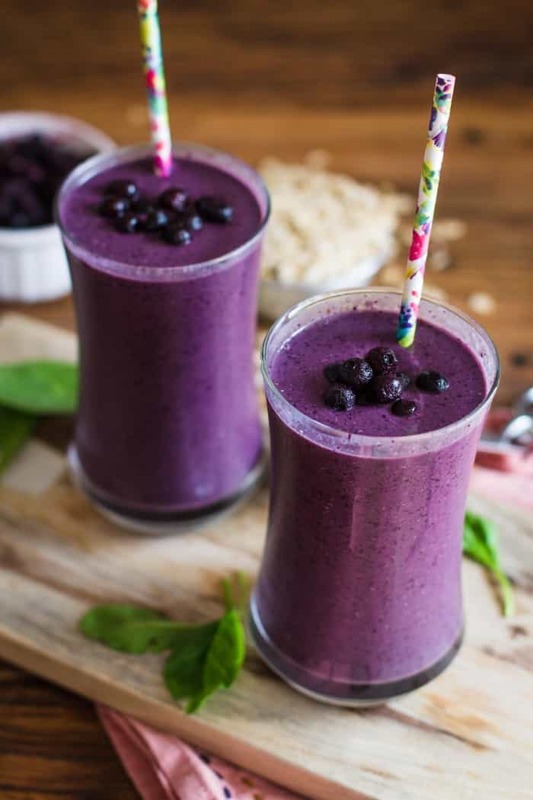 Most often it will be for breakfast but on certain days I plan to make one of these Meal Replacement Blueberry Green Smoothies and take it for lunch at work. I figure that I should start my new years resolution-ing off a bit early and maybe that will help it all stick. Maybe. 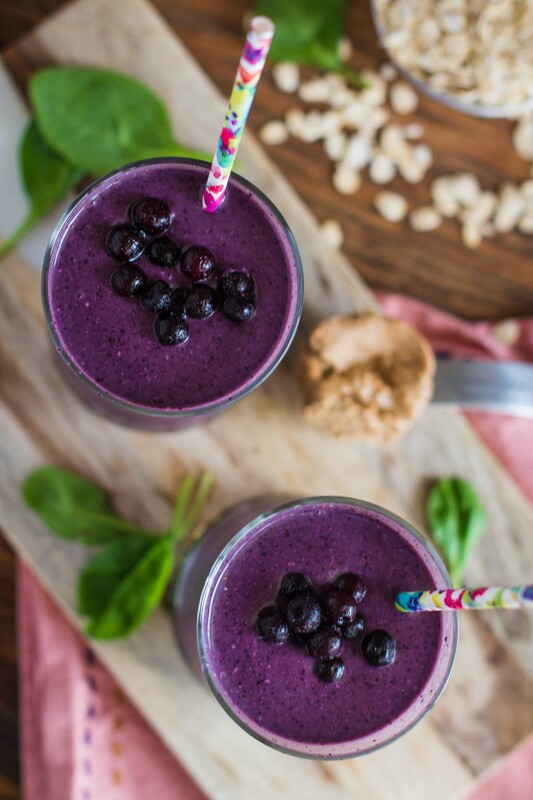 I’ve been experimenting with lots of different YUMMY smoothie flavors and combinations. 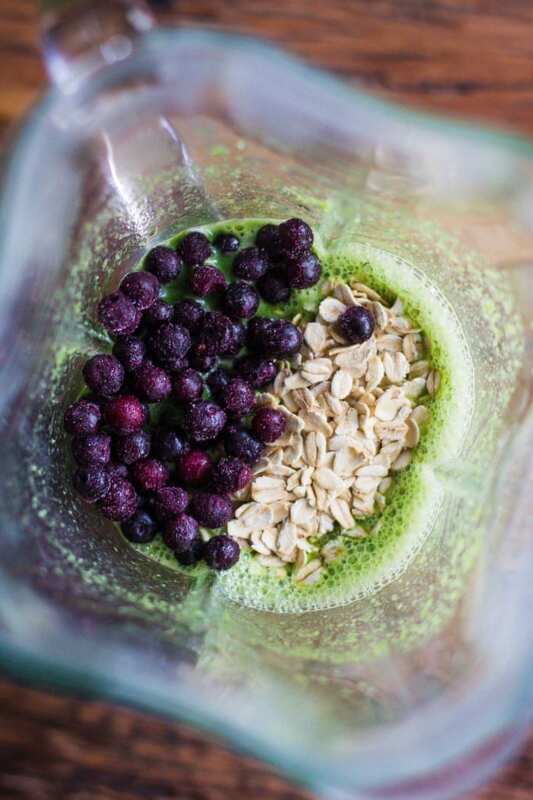 Simple Green Smoothies has a really great little guide that I’ve used to know how to turn a “regular” smoothie into a meal replacement smoothie. 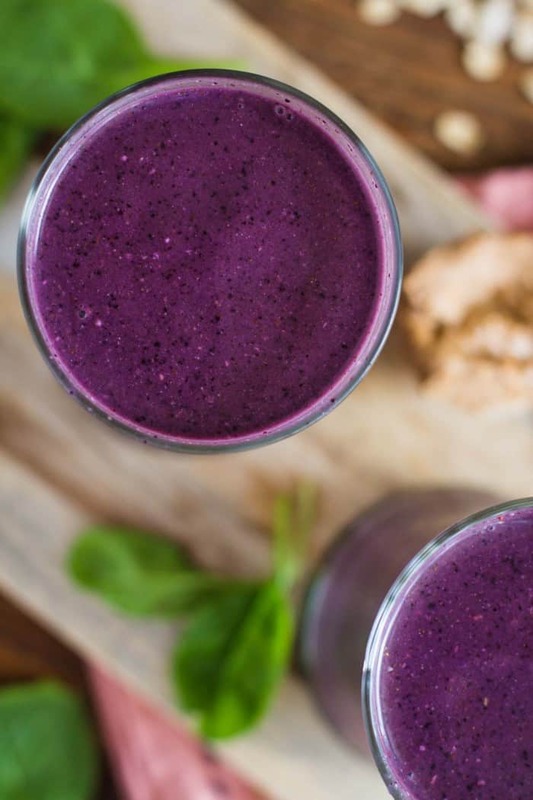 The gist of it is that you want to make sure that your green smoothie is a fully balanced meal meaning that you need to have protein and healthy fats in it. They have a great little chart to help out. For this one, we’re going with almond butter and rolled oats. 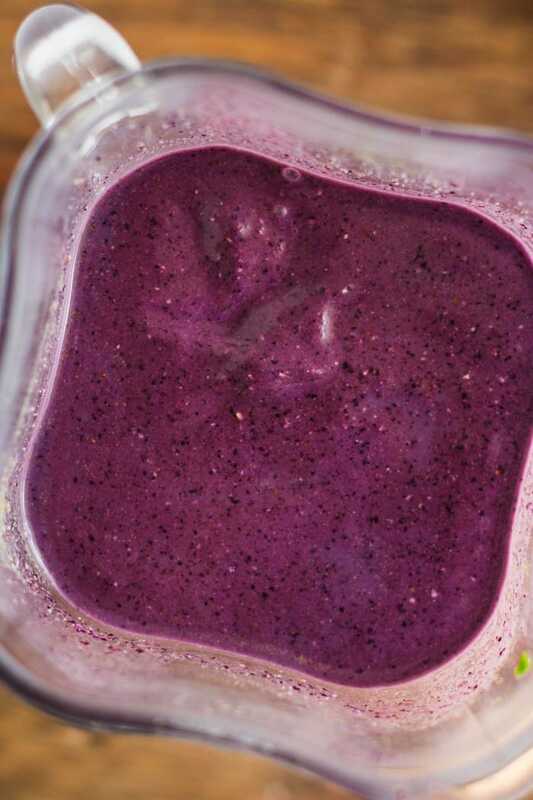 The smoothie comes along similar to the green smoothie that we made last week. The greens are mixed with a bit of liquid and left to liquify for a good 60 seconds. I used almond milk this go around instead of water but really either will work just fine. The almond butter, berries, and oats are then added in (along with an unpictured banana). 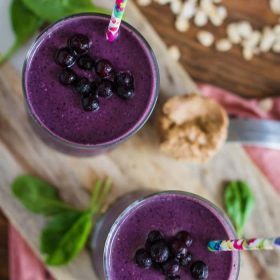 All of my smoothie recipe’s are made for just one person but you can easily double this recipe to make it for more than one person. ALright. I’m off to recipe test more of these green smoothies and take it in a to-go cup with me so that I’m well nourished in order to agonize over varies shades of blue paint for our bedroom. 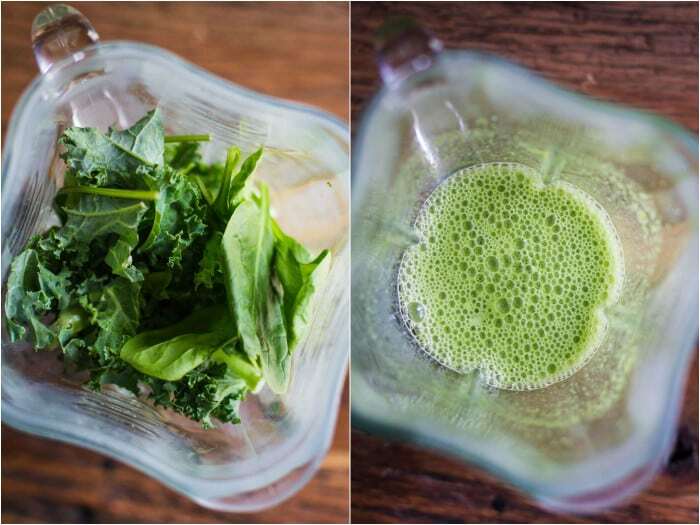 In a blender, combine the almond milk and greens and blend until completely liquified, about 60 seconds. Add in the remaining ingredients and blend until completely smooth. You may need to add a bit more liquid halfway through the blending process. This looks great! I’m going to have to give it a try! Can’t wait to see what paint colors you pick!